Fishing is not just the pursuit of that elusive big fish by a man - or men - wanting to enjoy the great outdoors; fishing is a sport that many men spend a considerable amount of their time engaged in. To this end the serious fisherman not only needs to have the right equipment; rods, nets, flies, lines etc; but also the right clothing so that they can be warm and dry whilst braving the elements. The best way to describe Bib and Brace is as a set of dungarees into which the fisherman climbs and then clips the braces into position over their front either by sliding their arms through or by pulling the braces up and over the shoulders and locking them into position at the waistband. This style of dress is designed to provide as much protection from the elements as possible as well as reducing the amount of water that is allowed to get in underneath them. Newer Bib and Brace suits are now fitted with adjustable Velcro straps as opposed to old style braces which allow for more freedom of movement and prevent loss of movement. Over trousers are like ordinary waterproof trousers that you would pull on over your everyday clothing. The elasticised waist allows for snug fitting especially in larger sized men and the trousers can be either tucked under a jacket or out and over a jacket depending on their size and the amount of give. Most of these trousers - just like waterproofs - are waxed to allow the water to run off thus cutting down on the amount of water that seeps in. When purchasing these items it is important to ask your supplier as to whether or not the material 'breathes'; this means does the material allow air to flow through tiny holes in the material to prevent it sticking to the under garments or skin. A two piece suit will encompass a jacket and either Bib and Brace dungarees or over trousers. A two piece suit is often more cost effective than buying both garments separately and also any fisherman purchasing a full two piece suit will find that the garments will have a series of pockets of varying shapes and sizes that will accommodate a considerable amount of fishing tackle and bait as well as any knives and other such equipment. It is important also when purchasing your fishing attire to look at what to wear on your head as well as on your feet. Obviously the more money you have to spend the better the clothing will be but any hat will do to begin with. A woollen hat in the winter is best and a light hat - perhaps a baseball hat or a flop hat is better in the summer months when there is more sunshine and higher temperatures. When standing next to - or indeed in a river - it is important to try and minimise the amount of water that gets into your footwear. 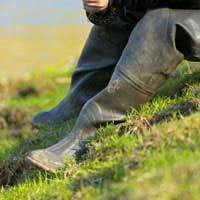 All purpose Wellington boots and waders are a good way to go about this as well as making sure the tops of your boots are secured with some tape or other material to close up any gaps. If you are interested in purchasing attire for fishing there are many different outfitters in the United Kingdom which can be found on the high street and online. It is a good idea to speak to such an outfitters - especially if you are new to fishing - or indeed ask for advice from your local fishing or angling club.